All the sheds are protected with an water based treatment please see terms and conditions for further information regarding this treatment. All timber sizes quoted are nominal prior to machining. Tanalised Range - at TJ's there is also the option of a garden shed which is pressure treated, this range is manufactured from tongued and grooved boards which have been injected with a treatment. This means you do not have to continue any maintenanceof the timber once installed. A full specification of each range is detailed within each garden shed range. All prices shown include FITTING within a specified zone, if your post code falls outside the standard areas please ask for quotation for fitting. Also if the size of shed you require is not shown please call one of the team who will be happy to help. The Executive range is made with 16mm Tongued and Grooved Board and is ideal for storage and general.. The Scandinavian Pent is ideal for storage and general household uses. 22mm Tongued and Groove.. The standard range shed is made with 16mm Tongued and Grooved Board and is ideal for storage an.. 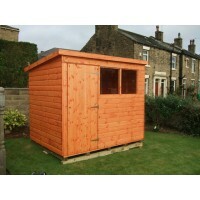 The Tanalised Pent shed is ideal for storage and general household uses. 2 x 2 Framework Pre.. The Viking range is made with 16mm Tongued and Grooved Board Pent and is ideal for storage and gener..